DIE Sabbati, videlicet, 25 Junii. Letter from the King to the Speaker, with His Answer to the Petition of both Houses. Message to the H. C. for a Conference on the King's Answer. 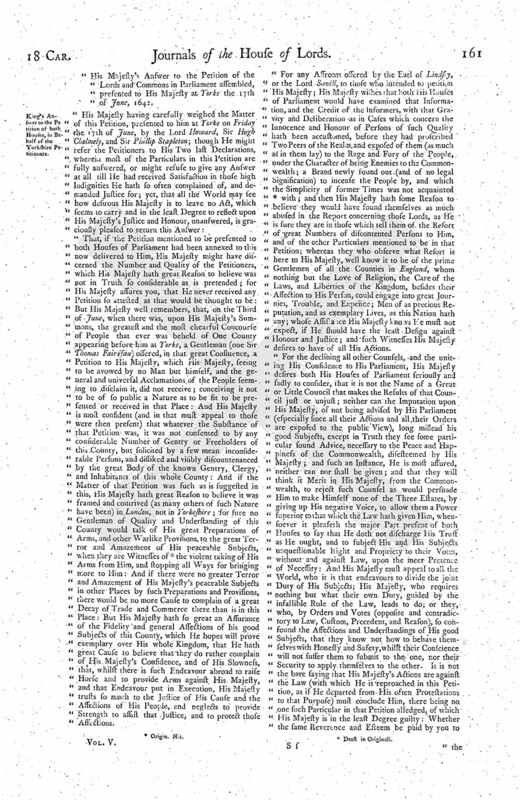 Walker, for publishing a Libel, removed to Newgate. and for this and other Bills to be sent to the King, for the Royal Assent. Hall the Sword-bearer examined about publishing the Proclamation in the City, against bringing in Money, &c.
King's Answer to the Petition of both Houses, in Behalf of the Yorkshire Petitioners. Hall the Sword-bearer committed for publishing the Proclamation in the City. L. Mayor and Sheriffs to attend. The Lord Wharton was appointed to be Speaker this Day. Mr. Justice Foster and Mr. Dr. Aylott reported, That they have delivered their Message to the House of Commons." The Petition of Benja. Newland, was read, concerning the Business between him and Joseph Hawes; and the Judges acquainted this House with the Proceedings of this Business in the Court of Common Pleas. Ordered, That the Judges in the Common Pleas shall proceed in the Cause depending in that Court, as the Course of that Court is; and what is sit for the Proceedings of the Court of Admiralty, to stand as is Ordered by this House. "Right Trusty and Well-beloved, We greet you well. Our Will and Pleasure is, That you forthwith deliver, to be read in Our House of Peers, and afterwards communicated to Our House of Commons, Our Answer (sent inclosed) to the Petition of the Lords and Commons in Parliament assembled, presented to Us at Yorke the 17th of June, 1642; and for so doing, this shall be your Warrant. "Given at Our Court at Yorke, the 22d of June' 1642." It is Ordered, That this Answer of the King's shall be communicated to the House of Commons. To desire a present Conference, touching an Answer sent from His Majesty, of as great Concernment as ever came into this House. Ordered, That Walker, now a Prisoner in The Tower, for being the Author and Publisher of a seditious Libel, shall be safely conveyed, by the Lieutenant of The Tower, to Newgate; and this House leaves it to the King's Counsel to proceed against him according to Law. The Matter of the Conference was to be, "To let the House of Commons know, that they conceive this Message the (fn. 1) most dangerous and highest that hath come to them, whereby it appears that divers scandalous and false Informations are come to His Majesty's Ears, even of Things within their own Walls; which because His Majesty seems to believe, and declare to the World under His own Name, it is high Time for both Houses to clear themselves from those Calumnies, by the Punishment of those false Informers, and all other good Ways as may be thought of." A Message was brought from the House of Commons, by Mr. Solicitor; who brought from the House of Commons a Bill for Tonnage and Poundage, with a Book of Rates annexed. 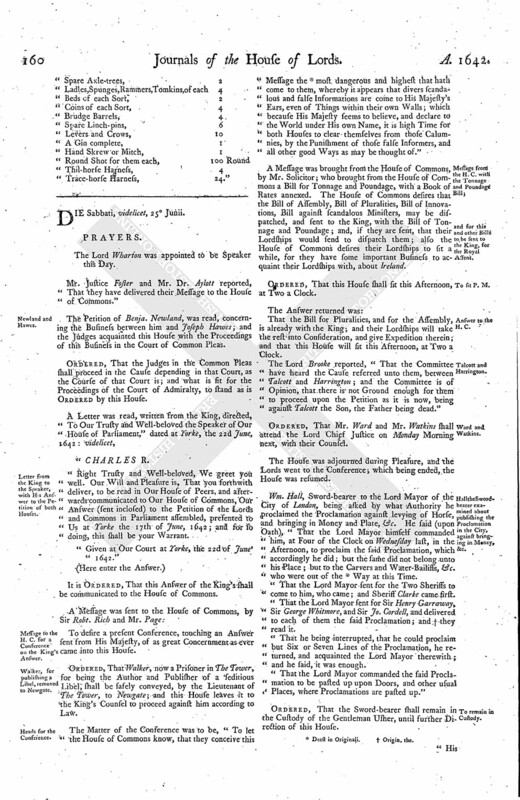 The House of Commons desires that the Bill of Assembly, Bill of Pluralities, Bill of Innovations, Bill against scandalous Ministers, may be dispatched, and sent to the King, with the Bill of Tonnage and Poundage; and, if they are sent, that their Lordships would send to dispatch them; also the House of Commons desires their Lordships to sit a while, for they have some important Business to acquaint their Lordships with, about Ireland. Ordered, That this House shall sit this Afternoon, at Two a Clock. That the Bill for Pluralities, and for the Assembly, is already with the King; and their Lordships will take the rest into Consideration, and give Expedition therein; and that this House will sit this Afternoon, at Two a Clock. The Lord Brooke reported, "That the Committee have heard the Cause referred unto them, between Talcott and Harrington; and the Committee is of Opinion, that there is not Ground enough for them to proceed upon the Petition as it is now, being against Talcott the Son, the Father being dead." Ordered, That Mr. Ward and Mr. Watkins shall attend the Lord Chief Justice on Monday Morning next, with their Counsel. The House was adjourned during Pleasure, and the Lords went to the Conference; which being ended, the House was resumed. Wm. Hall, Sword-bearer to the Lord Mayor of the City of London, being asked by what Authority he proclaimed the Proclamation against levying of House, and bringing in Money and Plate, &c. He said (upon Oath), "That the Lord Mayor himself commanded him, at Four of the Clock on Wednesday last, in the Afternoon, to proclaim the said Proclamation, which accordingly he did; but the same did not belong unto his Place; but to the Carvers and Water-Bailiffs, &c. who were out of the (fn. 1) Way at this Time. "That the Lord Mayor sent for the Two Sheriffs to come to him, who came; and Sheriff Clarke came first. "That the Lord Mayor sent for Sir Henry Garraway, Sir George Whitmore, and Sir Jo. Cordell, and delivered to each of them the said Proclamation; and (fn. 2) they read it. "That he being interrupted, that he could proclaim but Six or Seven Lines of the Proclamation, he returned, and acquainted the Lord Mayor therewith; and he said, it was enough. "That the Lord Mayor commanded the said Proclamation to be pasted up upon Doors, and other usual Places, where Proclamations are pasted up." Ordered, That the Sword-bearer shall remain in the Custody of the Gentleman Usher, until further Direction of this House. 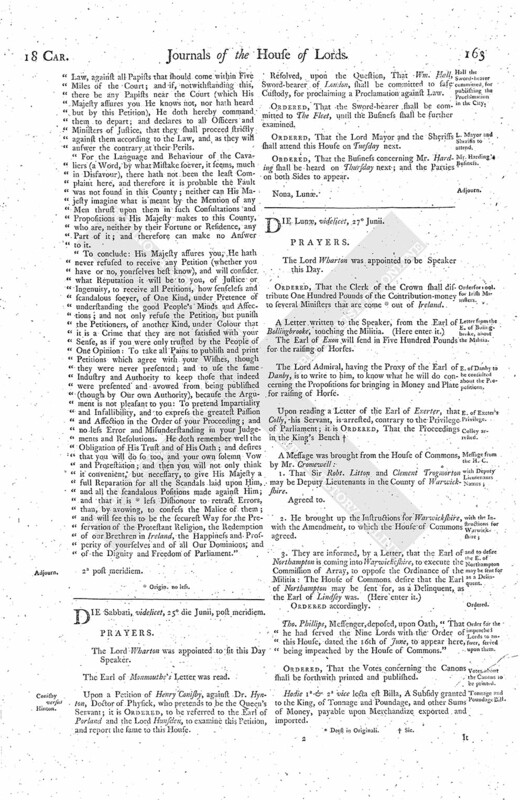 "His Majesty's Answer to the Petition of the Lords and Commons in Parliament assembled, presented to His Majesty at Yorke the 17th of June, 1642. 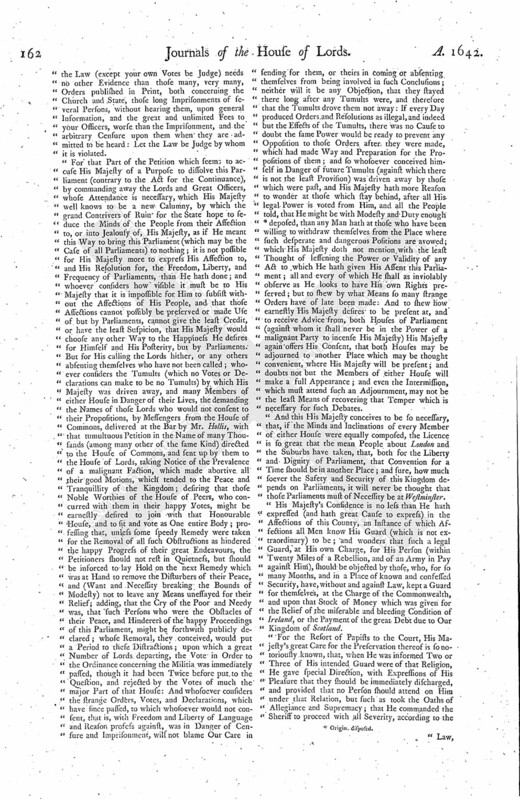 "That, if the Petition mentioned to be presented to both Houses of Parliament had been annexed to this now delivered to Him, His Majesty might have discerned the Number and Quality of the Petitioners, which His Majesty hath great Reason to believe was not in Truth so considerable as is pretended; for His Majesty assures you, that He never received any Petition so attested as that would be thought to be: But His Majesty well remembers, that, on the Third of June, when there was, upon His Majesty's Summons, the greatest and the most chearful Concourse of People that ever was beheld of One County appearing before him at Yorke, a Gentleman (one Sir Thomas Fairefax) offered, in that great Consluence, a Petition to His Majesty, which His Majesty, seeing to be avowed by no Man but himself, and the general and universal Acclamations of the People seeming to disclaim it, did not receive; conceiving it not to be of so public a Nature as to be fit to be presented or received in that Place: And His Majesty is most confident (and in that must appeal to those were then present) that whatever the Substance of that Petition was, it was not consented to by any considerable Number of Gentry or Freeholders of this County, but solicited by a few mean inconsiderable Persons, and disliked and visibly discountenanced by the great Body of the known Gentry, Clergy, and Inhabitants of this whole County: And if the Matter of that Petition was such as is suggested in this, His Majesty hath great Reason to believe it was framed and contrived (as many others of such Nature have been) in London, not in Yorkeshire; for sure no Gentleman of Quality and Understanding of this County would talk of His great Preparations of Arms, and other Warlike Provisions, to the great Terror and Amazement of His peaceable Subjects, when they are Witnesses of (fn. 3) the violent taking of His Arms from Him, and stopping all Ways for bringing more to Him: And if there were no greater Terror and Amazement of His Majesty's peaceable Subjects in other Places by such Preparations and Provisions, there would be no more Cause to complain of a great Decay of Trade and Commerce there than is in this Place: But His Majesty hath so great an Assurance of the Fidelity and general Affections of his good Subjects of this County, which He hopes will prove exemplary over His whole Kingdom, that He hath great Cause to believe that they do rather complain of His Majesty's Confidence, and of His Slowness, that, whilst there is such Endeavour abroad to raise Horse and to provide Arms against His Majesty, and that Endeavour put in Execution, His Majesty trusts so much to the Justice of His Cause and the Affections of His People, and neglects to provide Strength to assist that Justice, and to protect those Affections. "For any Affornts offered by the Earl of Lindsey, or the Lord Savill, to those who intended to petition His Majesty; His Majesty wishes that both His Houses of Parliament would have examined that Information, and the Credit of the Informers, with that Gravity and Deliberation as in Cases which concern the Innocence and Honour of Persons of such Quality hath been accustomed, before they had proscribed Two Peers of the Realm, and exposed of them (as much as in them lay) to the Rage and Fury of the People, under the Character of being Enemies to the Commonwealth; a Brand newly found out (and of no legal Signification) to incense the People by, and which the Simplicity of former Times was not acquainted (fn. 4) with; and then His Majesty hath some Reason to believe they would have found themselves as much abused in the Report concerning those Lords, as He is sure they are in those which tell them of the Resort of great Numbers of discontented Persons to Him, and of the other Particulars mentioned to be in that Petition; whereas they who observe what Resort is here to His Majesty, well know it to be of the prime Gentlemen of all the Counties in England, whom nothing but the Love of Religion, the Care of the Laws, and Liberties of the Kingdom, besides their Affection to His Person, could engage into great Journies, Trouble, and Expence; Men of as precious Reputation, and as exemplary Lives, as this Nation hath any; whose Assistance His Majesty knows He must not expect, if He should have the least Design against Honour and Justice; and such Witnesses His Majesty desires to have of all His Actions. "For the declining all other Counsels, and the uniting His Confidence to His Parliament, His Majesty desires both His Houses of Parliament seriously and sadly to consider, that it is not the Name of a Great or Little Council that makes the Results of that Council just or unjust; neither can the Imputation upon His Majesty, of not being advised by His Parliament (especially since all their Actions and all their Orders are exposed to the public View), long mislead his good Subjects, except in Truth they see some particular found Advice, necessary to the Peace and Happiness of the Commonwealth, disesteemed by His Majesty; and such an Instance, He is most assured, neither can nor shall be given; and that they will think it Merit in His Majesty, from the Commonwealth, to reject such Counsel as would persuade Him to make Himself none of the Three Estates, by giving up His negative Voice, to allow them a Power superior to that which the Law hath given Him, whensoever it pleaseth the major Part present of both Houses to say that He doth not discharge His Trust as He ought, and to subject His and His Subjects unquestionable Right and Propriety to their Votes, without and against Law, upon the meer Pretence of Necessity: And His Majesty must appeal to all the World, who it is that endeavours to divide the joint Duty of His Subjects; His Majesty, who requires nothing but what their own Duty, guided by the infallible Rule of the Law, leads to do; or they, who, by Orders and Votes (opposite and contradictory to Law, Custom, Precedent, and Reason), so confound the Affections and Understandings of His good Subjects, that they know not how to behave themselves with Honesty and Safety, whilst their Conscience will not suffer them to submit to the one, nor their Security to apply themselves to the other. It is not the bare saying that His Majesty's Actions are against the Law (with which He is reproached in this Petition, as if He departed from His often Protestations to that Purpose) must conclude Him, there being no one such Particular in that Petition alledged, of which His Majesty is in the least Degree guilty: Whether the same Reverence and Esteem be paid by you to the Law (except your own Votes be Judge) needs no other Evidence than those many, very many, Orders published in Print, both concerning the Church and State, those long Imprisonments of several Persons, without hearing them, upon general Information, and the great and unlimited Fees to your Officers, worse than the Imprisonment, and the arbitrary Censure upon them when they are admitted to be heard: Let the Law be Judge by whom it is violated. "For that Part of the Petition which seems to accuse His Majesty of a Purpose to dissolve this Parliament (contrary to the Act for the Continuance), by commanding away the Lords and Great Officers, whose Attendance is necessary, which His Majesty well knows to be a new Calumny, by which the grand Contrivers of Ruin for the State hope to seduce the Minds of the People from their Affection to, or into Jealousy of, His Majesty, as if He meant this Way to bring this Parliament (which may be the Case of all Parliaments) to nothing; it is not possible for His Majesty more to express His Affection to, and His Resolution for, the Freedom, Liberty, and Frequency of Parliaments, than He hath done; and whoever considers how visible it must be to His Majesty that it is impossible for Him to subsist without the Affections of His People, and that those Affections cannot possibly be preserved or made Use of but by Parliaments, cannot give the least Credit, or have the least Suspicion, that His Majesty would choose any other Way to the Happiness He desires for Himself and His Posterity, but by Parliaments. But for His calling the Lords hither, or any others absenting themselves who have not been called; whoever considers the Tumults (which no Votes or Declarations can make to be no Tumults) by which His Majesty was driven away, and many Members of either House in Danger of their Lives, the demanding the Names of those Lords who would not consent to their Propositions, by Messengers from the House of Commons, delivered at the Bar by Mr. Hollis, with that tumultuous Petition in the Name of many Thousands (among many other of the same Kind) directed to the House of Commons, and sent up by them to the House of Lords, taking Notice of the Prevalence of a malignant Faction, which made abortive all their good Motions, which tended to the Peace and Tranquillity of the Kingdom; desiring that those Noble Worthies of the House of Peers, who concurred with them in their happy Votes, might be earnestly desired to join with that Honourable House, and to sit and vote as One entire Body; prosessing that, unless some speedy Remedy were taken for the Removal of all such Obstructions as hindered the happy Progress of their great Endeavours, the Petitioners should not rest in Quietness, but should be inforced to lay Hold on the next Remedy which was at Hand to remove the Disturbers of their Peace, and (Want and Necessity breaking the Bounds of Modesty) not to leave any Means unessayed for their Relief; adding, that the Cry of the Poor and Needy was, that such Persons who were the Obstacles of their Peace, and Hinderers of the happy Proceedings of this Parliament, might be forthwith publicly declared; whose Removal, they conceived, would put a Period to these Distractions; upon which a great Number of Lords departing, the Vote in Order to the Ordinance concerning the Militia was immediately passed, though it had been Twice before put to the Question, and rejected by the Votes of much the major Part of that House: And whosoever considers the strange Orders, Votes, and Declarations, which have since passed, to which whosoever would not consent, that is, with Freedom and Liberty of Language and Reason profess against, was in Danger of Censure and Imprisonment, will not blame Our Care in sending for them, or theirs in coming or absenting themselves from being involved in such Conclusions; neither will it be any Objection, that they stayed there long after any Tumults were, and therefore that the Tumults drove them not away: If every Day produced Orders and Resolutions as illegal, and indeed but the Effects of the Tumults, there was no Cause to doubt the same Power would be ready to prevent any Opposition to those Orders after they were made, which had made Way and Preparation for the Propositions of them; and so whosoever conceived himself in Danger of future Tumults (against which there is not the least Provision) was driven away by those which were past, and His Majesty hath more Reason to wonder at those which stay behind, after all His legal Power is voted from Him, and all the People told, that He might be with Modesty and Duty enough (fn. 5) deposed, than any Man hath at those who have been willing to withdraw themselves from the Place where such desperate and dangerous Positions are avowed; which His Majesty doth not mention with the least Thought of lessening the Power or Validity of any Act to which He hath given His Assent this Parliament; all and every of which He shall as inviolably observe as He looks to have His own Rights preserved; but to shew by what Means so many strange Orders have of late been made: And to shew how earnestly His Majesty desires to be present at, and to receive Advice from, both Houses of Parliament (against whom it shall never be in the Power of a malignant Party to incense His Majesty) His Majesty again offers His Consent, that both Houses may be adjourned to another Place which may be thought convenient, where His Majesty will be present; and doubts not but the Members of either House will make a full Appearance; and even the Intermission, which must attend such an Adjournment, may not be the least Means of recovering that Temper which is necessary for such Debates. "And this His Majesty conceives to be so necessary, that, if the Minds and Inclinations of every Member of either House were equally composed, the Licence is so great that the mean People about London and the Suburbs have taken, that, both for the Liberty and Dignity of Parliament, that Convention for a Time should be in another Place; and sure, how much soever the Safety and Security of this Kingdom depends on Parliaments, it will never be thought that those Parliaments must of Necessity be at Westminster. "His Majesty's Confidence is no less than He hath expressed (and hath great Cause to express) in the Affections of this County, an Instance of which Affections all Men know His Guard (which is not extraordinary) to be; and wonders that such a legal Guard, at His own Charge, for His Person (within Twenty Miles of a Rebellion, and of an Army in Pay against Him), should be objected by those, who, for so many Months, and in a Place of known and confessed Security, have, without and against Law, kept a Guard for themselves, at the Charge of the Commonwealth, and upon that Stock of Money which was given for the Relief of the miserable and bleeding Condition of Ireland, or the Payment of the great Debt due to Our Kingdom of Scotland. "For the Resort of Papists to the Court, His Majesty's great Care for the Preservation thereof is so notoriously known, that, when He was informed Two or Three of His intended Guard were of that Religion, He gave special Direction, with Expressions of His Pleasure that they should be immediately discharged, and provided that no Person should attend on Him under that Relation, but such as took the Oaths of Allegiance and Supremacy; that He commanded the Sheriff to proceed with all Severity, according to the Law, against all Papists that should come within Five Miles of the Court; and if, notwithstanding this, there be any Papists near the Court (which His Majesty assures you He knows not, nor hath heard but by this Petition), He doth hereby command them to depart; and declares to all Officers and Ministers of Justice, that they shall proceed strictly against them according to the Law, and as they will answer the contrary at their Perils. "For the Language and Behaviour of the Cavaliers (a Word, by what Mistake soever, it seems, much in Disfavour), there hath not been the least Complaint here, and therefore it is probable the Fault was not found in this County; neither can His Majesty imagine what is meant by the Mention of any Men thrust upon them in such Consultations and Propositions as His Majesty makes to this County, who are, neither by their Fortune or Residence, any Part of it; and therefore can make no Answer to it. "To conclude: His Majesty assures you, He hath never refused to receive any Petition (whether you have or no, yourselves best know), and will consider what Reputation it will be to you, of Justice or Ingenuity, to receive all Petitions, how senseless and scandalous soever, of One Kind, under Pretence of understanding the good People's Minds and Affections; and not only refuse the Petition, but punish the Petitioners, of another Kind, under Colour that it is a Crime that they are not satisfied with your Sense, as if you were only trusted by the People of One Opinion: To take all Pains to publish and print Petitions which agree with your Wishes, though they were never presented; and to use the same Industry and Authority to keep those that indeed were presented and avowed from being published (though by Our own Authority), because the Argument is not pleasant to you: To pretend Impartiality and Infallibility, and to express the greatest Passion and Affection in the Order of your Proceeding; and no less Error and Misunderstanding in your Judgements and Resolutions. He doth remember well the Obligation of His Trust and of His Oath; and desires that you will do so too, and your own solemn Vow and Protestation; and then you will not only think it convenient, but necessary, to give His Majesty a full Reparation for all the Scandals laid upon Him, and all the scandalous Positions made against Him; and that it is (fn. 6) less Dishonour to retract Errors, than, by avowing, to confess the Malice of them; and will see this to be the securest Way for the Preservation of the Protestant Religion, the Redemption of our Brethren in Ireland, the Happiness and Prosperity of yourselves and of all Our Dominions, and of the Dignity and Freedom of Parliament." The Lord Wharton was appointed to sit this Day Speaker. The Earl of Monmouthe's Letter was read. Upon a Petition of Henry Conisby, against Dr. Hynton, Doctor of Physick, who pretends to be the Queen's Servant; it is Ordered, to be referred to the Earl of Porland and the Lord Hunsden, to examine this Petition, and report the same to this House. Resolved, upon the Question, That Wm. Hall, Sword-bearer of London, shall be committed to safe Custody, for proclaiming a Proclamation against Law. Ordered, That the Sword-bearer shall be committed to The Fleet, until the Business shall be further examined. Ordered, That the Lord Mayor and the Sheriffs shall attend this House on Tuesday next. Ordered, That the Business concerning Mr. Harding shall be heard on Thursday next; and the Parties on both Sides to appear.